Nice! Congrats on the article. I wonder if that magazine is available in the U.S.? I’ll have to check into that. Thanks for the link. Hi Glenda! Inspirations should be available in the US. The ones I see here in Germany are printed in the UK. Thank you for visiting, and for your comment. I used to get Inspirations every issue but stopped about 5 years ago. Your post prompted me to get the latest issue and see what’s changed, as well as read about your work. But when I got to the newsagents they has sold out. Oh no! Ah well, congratulations on your article. Your stitching is beautiful. 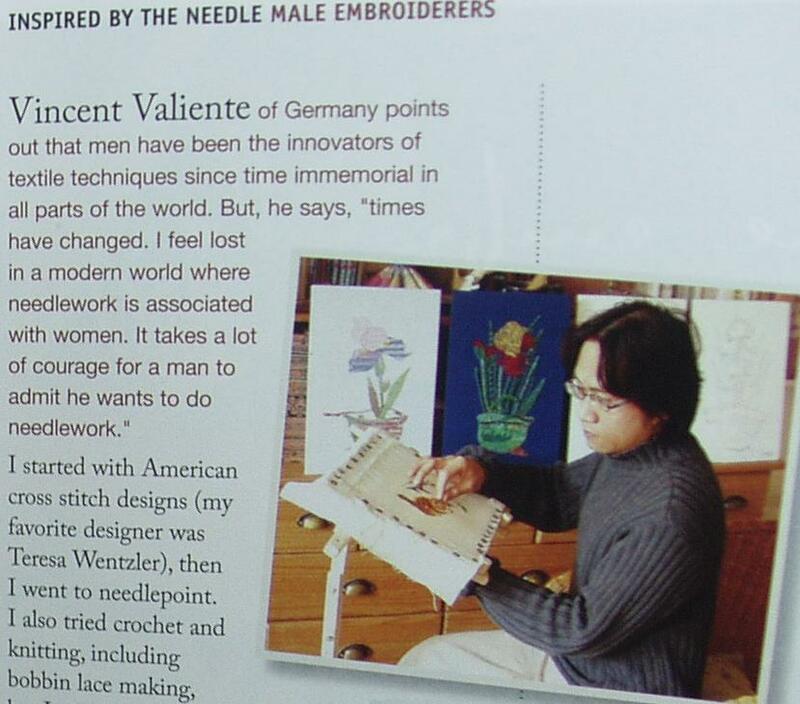 As you say, male embroiderers are few and far between, but I’ve known several over the years. I really like your photography art. I always look forward to seeing more. Vincent a belated congrats on the article!!! I hope I can still find it here at the local Barnes and Nobel book store. If not any chance of scanning the pages so I could read it here on your blog? Also you must relate how this all came about. Hi Jan! I subscribe to the Newsletter of Country Bumpkin publications and they emailed the article lately. 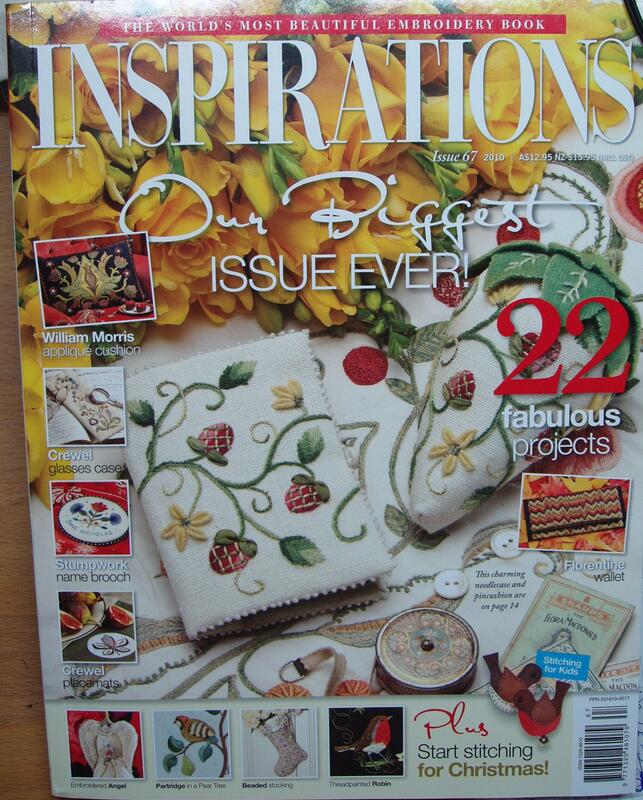 I started with American cross stitch designs (my favourite designer was Teresa Wentzler), then I went to needlepoint. I also tried crochet and knitting, including bobbin lace making, but I could not relate to the Western designs and techniques. I then discovered Asian embroideries using indigenous materials and advanced embroidery. In Asia I knew that there still existed the master-apprentice system of passing down techniques and craftsmanship. I am interested in learning Asian embroidery techniques and write about it in my blog: worksofhands.wordpress.com. I learned to weave very fine pineapple fibres and silk and banana hemp from weavers in an island in the Philippines, and they gave me metres of handwoven fabrics of plant fibres as a gift. I learned to do religious goldwork from a retired embroiderer in Manila. The Filipinos adapted the bordado del oro or goldwork embroidery on religious icons from the Spanish colonisers. I want to develop my skills in goldwork embroidery. I noticed that Japan, China, Spain and England each have a different technique in goldwork, each worth learning. I am now working on a Suzhou silk needlepainting embroidery kit, a japanese totsuka embroidery design and a Tibetan appliquéd silk thangka. In March this year, Vincent won first prize in the Fadenkreuz competition sponsored by the German Embroidery Guild and the German Lace Guild with his Heiwa handkerchief. This lace sampler represents the tears shed in wars. Heiwa means peace in Japanese. Margie Bauer, the publisher of Country Bumpkin, emailed me last year that they will feature male embroiderers in one of their issues. The text is what I wrote her that time. When they asked me about photos of my works, they added the info about me winning in a competition. I have long finished the cat silk embroidery and the japanese helmet embroidery. I also stopped the appliquéd thangka last year. I bet they already have the articles for next year´s issues. Last issue, Mary Corbet (Needle ´n Thread) was featured too. It is only when I read the article in the magazine that I understood your are a man even if I follow your work for a while. Your work is fantastic and congratulation for the article. I was given a copy of Inspirations for Christmas and couldn’t help noticing your Heiwa handkerchief straight away. It is beautiful! I would like to work on cotton muslin similar to that used for Dresden Lace in the 1700’s, but I have not found anything suitable so far. What thread count did you use on your handkerchief and what type of cloth? You may be interested to know that we have about 180 members of our Guild and 2 of them are men.